More than 80% of Kolkata’s sewage is naturally getting purified in East Kolkata Wetlands (EKW) where wastewater treatment and fishery practices are integrated through a rare correspondence of stages generating double dividend. The city of Kolkata enjoys a subsidized service of wastewater treatment as well as low-cost supply chain of fresh fish, vegetables, etc., and EKW is enjoying traditional livelihood options through wise-use practices. However, this delicately balanced ecosystem is threatened by the aggressive eastbound urban growth of the city. A significant change has been observed in the pattern of land use in the buffer area. To protect the wise-use of the wetland any further change in the pattern of land use in the core area has been legally prohibited. In spite of that a tendency towards vocation switching is noted all over the place. If this propensity continues and especially, if fisheries stop dominating the livelihood option of the local residents, then that will not only affect the low-cost supply chain available to the city dwellers, but also will challenge continuity of the waste management practice as well. The paper tried to estimate this opportunity cost for Kolkata. 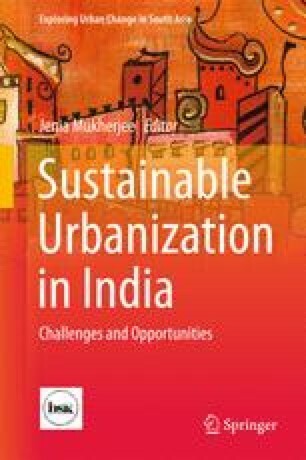 The authors are grateful to National Field Services of India for support in conducting the primary survey. Asian Development Bank. (2000). Report and recommendation of the president to the board of directors on a proposed loan to India for the Calcutta environmental improvement project. RRP: IND 29466. Retrieved April 11, 2016, from http://www.adb.org/sites/default/files/projdocs/2000/rrp-29466-ind.pdf. Bose, P. C. (1944). Calcutta sewage and fish culture. Read at Symposium August 28 1944. Corporation of Calcutta. Retrieved April 11, 2016, from http://www.new.dli.ernet.in/rawdataupload/upload/insa/INSA_1/20005b8d_443.pdf. Census of India. (2011). Retrieved April 2, 2016, from http://censusindia.gov.in/. Central Pollution Control Board. (2003). Status of sewage treatment plants in Ganga Basin. Retrieved April 2, 2016, from http://www.cpcb.nic.in/newitems/8.pdf. Central Pollution Control Board. (2005). Status of sewage treatment in India. Retrieved April 2, 2016 http://www.cpcb.nic.in/newitems/12.pdf. Centre for Science and Environment. (2012). Cases on protection of lakes: East Kolkata Wetlands, West Bengal. Retrieved April 2, 2016, from http://www.cseindia.org/node/2557. Centre for Science and Environment. (2011). Kolkata—The water waste portrait, coastal cities. Retrieved April 2, 2016, from http://www.cseindia.org/userfiles/kolkata_chapter.pdf. (Accessed 25 April 2013). EPA. (2004). Primer for Municipal wastewater treatment systems. Retrieved November 2, 2016, from http://water.epa.gov/aboutow/owm/upload/2005_08_19_primer.pdf. Ghosh D. (2004). Ecologically subsidised city. Retrieved September 13, 2013, from http://indiaenvironmentportal.org.in/node/42552/. IWMED. (1997). Integrated study on wetland conservation and urban growth. Institute for Housing and Urban Development Studies, Rotterdam, The Netherlands, Project Paper 8, September 1997. Retrieved April 26, 2013, from http://www.ihs.nl/fileadmin/ASSETS/ihs/IHS_Publication/IHS_Project_Paper/IHS_PP_8_Integrated_Study_of_Wetland_Conservation_and_Urban_Growth__A_Case_of_Calcutta_s_Wetland.pdf. Kolkata Municipal Corporation. (2012). Mayor’s budget estimate for 2012–2013. Retrieved June 2, 2013, from https://www.kmcgov.in/KMCPortal/downloads/Estimate2012-2013.pdf). Kolkata Municipal Corporation. (2015). Basic statistics. Retrieved July 26, 2015, from https://www.kmcgov.in/KMCPortal/jsp/BasicStatistics.jsp. Kolkata Municipal Corporation. List of drainage pumping stations. Retrieved April 25, 2013, from https://www.kmcgov.in/KMCPortal/jsp/PumpingStation.jsp. Majumder, A. (2004) STP technologies & their cost effectivenes. Centre for Science and Environment (CSE). Retrieved October 21, 2013, from http://www.cseindia.org/userfiles/arunabha.pdf. Princep, T. (1828). The salt water lake, East of Calcutta, crowded with boats, with the city in the distance. Survey of the salt lake or marshes adjoining Calcutta. Retrieved April 10, 2013, from http://www.bl.uk/onlinegallery/onlineex/apac/other/019wdz000004193u00000000.html. Raju, K. D. (2012). The wetlands jurisprudence in India: A case study of the West Bengal conservation and management of wetlands and water bodies policy. Retrieved May 14, 2013, from http://indiaenvironmentportal.org.in/files/file/The%20Wetlands%20Jurisprudence%20In%20India.pdf. Reserve Bank of India. Retrieved April 20, 2013, from http://www.rbi.org.in. The Calcutta Electric Supply Corporation [CESC]. (2012). Tariff and associated terms and conditions. Retrieved October 21, 2013, from http://www.cesc.co.in/cesc/web/customer/regulator/document/Tariff%20Web.pdf. Wetland International, South Asia. (2008). Management plan for East Kolkata Wetlands. Final report submitted to East Kolkata Wetlands management authority. Department of Environment, Government of West Bengal, November 2008. Retrieved April 5, 2013, from http://www.ekwma.com/uploads/pdfs/.